COMPANY PROFILE Alior Bank SA is a national and universal bank, servicing all market segments. It offers all banking product and services like credit products, deposit products, brokerage products and investment funds, personal accounts, transaction service etc. Alior Bank SA is a universal lending and deposit-taking bank that provides services primarily to a Polish customer base. Its core activities include maintaining bank accounts, granting loans and advances, issuing banking securities, and buying and selling foreign currencies. Its subsidiary group company conducts brokerage activities, consulting, financial agency services, and other financial services. Its loan and advances book is diversified across various categories, notably retail cash loans and overdrafts, housing loans and other mortgages, working capital, and investment loans. About a quarter of the amounts due from customers originates from the Mazovia province. The group’s operations are financed from the funds of non-financial-sector customers deposited with the bank. 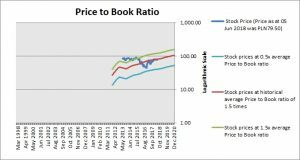 At the price of PLN79.50 as at 05 Jun 2018, Alior Bank Sa is trading at a Price to Book Ratio of 1.5 times current book value. 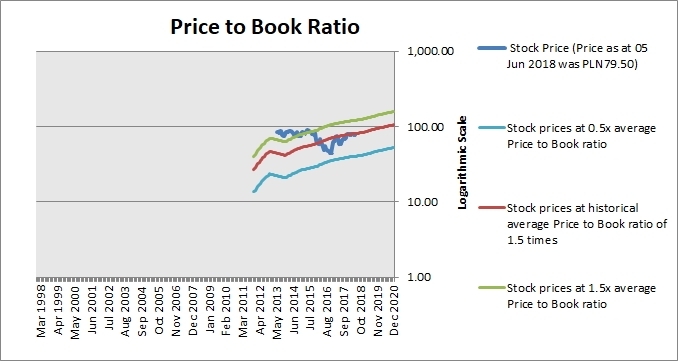 This is a 1% discount to its historical average Price to Book Ratio of 1.5 times.